Victoria (Vicki) Ann Vonhof was born in Oakland, California on November 8, 1962 to Hildred Marian and Robert John Vonhof. Our family experienced Vicki's love immediately after she was born. She had an extra chromosome 21, commonly called Down’s Syndrome. She gave unmeasurable love to a hurting family whose dad died six months after she was born. Little did we know that she would be the special gift to help hold a hurting family together. We cared for her and she gave back to us with her smiles and loving nature that quickly soothed our wounded hearts when we had to say goodbye and bury our father who had just turned 39. She was cute, loveable and gentle. Those traits lasted all her life. Vicki was loved by everyone who knew her. She was a beautiful baby and became an energetic child who loved to have fun, joke around, and always share a smile with those greeting her. 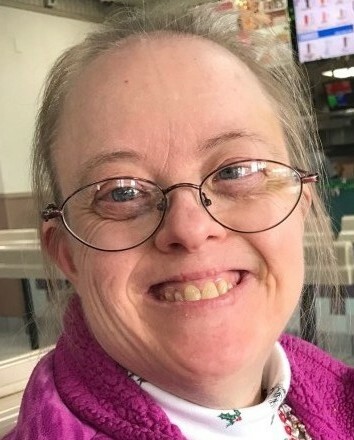 She attended school, going to special education classes at elementary school and then Alameda High School while also participating in the Special Olympics. Later when her mother and stepfather Frank Einfeld moved to Rossmoor, Vicki moved to a Sierra Salem Christian Home in Modesto, where she resided for 20 years. During that time, she worked several jobs through Valley CAPS Modesto until 2017. In 2014, she moved to the Malonzo Eldercare home in Modesto, where she blended in with the other residents. She loved television shows like NCIS and other action shows. In 2017, she could no longer attend her day program at Valley CAPS and stayed full-time with Cleofe and her staff. Soon after her health began a serious decline and she needed full time care. Vicki was loved by family and friends. She had a vivid imagination, funny quirks, and was fascinated with disasters she often saw in movies and heard in the news—often asking us if we knew about them. Her favorite activities were coloring and activity books—as long as she had the right color pens. Vicki was special in every way. She gave us joy and laughs for 56 years. Although she had serious health issues near the end, she still shared her love. Vicki is survived by sisters Sandra Lee Andriese of San Lorenzo, California and Marlene Joyce Schoo of Winchester, Idaho, and brothers John Albert Vonhof of Manteca, California and Robert Clifford Vonhof of Redding, California.